Urban Luxury is the design equivalent of lifestyle, comfort and indulgence. 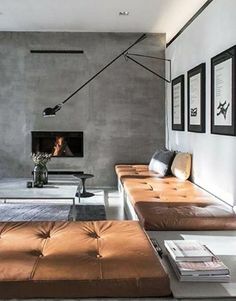 It is typically seen referencing materials such as metals, concrete and stone balanced with the softness of leathers, timber and luxurious textiles. This style is typically dark with a few highlight accents amongst the selection of finishes. The anchor colour can be either a crisp white or a warm grey depending on the scale of the space and the design objectives. Other than the accent pieces incorporated within, the palette is fairly monochromatic with a small reference to natural tones. Urban luxury is often accented by metals that may be brushed, matt or polished. The reflective qualities bring a little bling to the otherwise urban industrial feel. 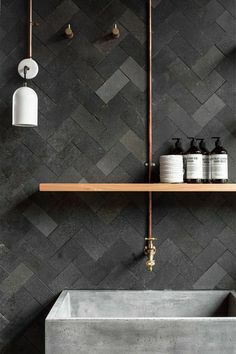 Below you can see a brushed copper pipe explore which is combined with the concrete and herringbone tile feature. To the left, the natural timber tones make the use of black much softer. Complimented by architectural design and interesting shapes, lines and textures this style would be appropriate for an inner city apartment or a suburban home needing a modern refresh. The balance of light and dark is extremely important. Trying to create negative space as an intentional way to deliver scale and impact, similarly to an art gallery, can be difficult, but in this case is very effective. Leveraging off statement design features, the Urban Luxury home doesn't need too much clutter to make it feel inspired. You may make a a feature out of a wall covered in the same tiles or timber as may appear on the floor or you may rest oversized piece of monochromatic art from the floor. This look is definitely more about quality over quantity. If this look sounds like something you are trying to achieve in your home renovation / rebuild and you just don't have the resources to create it, then your'e in luck. The Palette Store has created a selection of colours and finishes to get you on your way. Just click the button below to find out how you can get these product details to your inbox in minutes.